Nancy Turner photographed in her yard by Deddeda Stemler. Nancy Turner’s yard is a riot of native plants — camas and saskatoon berries, salmonberries and thimbleberries, wild gingers and rattlesnake plantain. 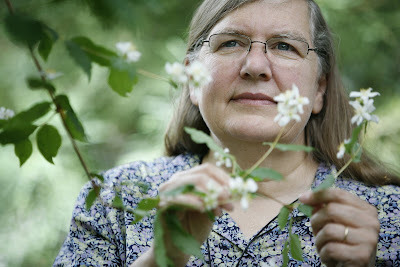 She is a scientist and so knows these plants also as Camassia leichtlinii and Amelanchier alnifolia, Rubus spectabilis and Rubus parviflorus, Asarum caudatum and Goodyera oblongifolia. She knows, too, these have other names in other languages (the Sto:lo, for instance, know the sweet thimbleberry as t’qwem) as well as a history and many different roles in indigenous cultures. This she has made her life’s work, not nearly complete after more than four decades of study, and for which she now has been named to the Order of Canada. Among all the thousands of accomplished personages to have been named to the Order, the Victoria professor is a rare ethnobotanist. Her research has taken her to the isolated northern coast, where she has harvested seaweed with the Gitga’at of Hartley Bay, south of Prince Rupert, and into meadows with the Tsartlip of Brentwood Bay, a long amble from the wildflowers of her own Saanich home. She watches preparations as elders lead the harvest of wild vegetables, or boil bulbs into a salve, or burn seeds for ceremonial purposes. The elders share with her their knowledge in the understanding it will be preserved for future generations. Thus, an ancient oral tradition finds its way into the classroom, the plant lore and agricultural customs of the indigenous peoples of British Columbia pressed into textbooks like a fallen leaf. Ms. Turner, 62, can hardly remember a time in her life when she was not fascinated by plants. By age 9, she belonged to a junior natural history society and had fallen under the spell of Freeman King, a local naturalist whose name now graces a park with centuries-old forests, where once licorice fern was used to ease stomach troubles. In Grade 12, she knew she wanted to be an ethnobotanist. A science degree at the University of Victoria was followed by a doctorate at the University of British Columbia and untold excursions into the bush. A fan of wild berries, the one that causes a pause is the soapberry. The traditional preparation includes mixing the crushed berries with water before whipping the concoction with a salal branch, or bare hand. “It gets stiff and frothy with a pink colour.” The result, which has the consistency of beaten egg whites, is mixed with strawberries, or apple juice. “A lot of elders I work with recall it with fondness and nostalgia.” She contemplated her own sampling of the delicacy. “It is an acquired taste,” she pronounced. The lessons learned in the field taught her the first peoples practiced a form of kincentric ecology in which all living things, even plants, were regarded as a kindred relation. They developed a permaculture. “It wasn’t random plucking,” she said of the harvesting of foods. “It was a system built up over hundreds of years. Ms. Turner, a professor in the University of Victoria’s school of environmental studies, has seen these traditions carried out on Princess Royal Island, a short boat ride from Hartley Bay, whose residents earned the province’s gratitude for their brave and selfless rescue of the passengers aboard a foundering ferry. The community continues to worry about the effect of leaking diesel oil from the sunken boat on the harvest of oysters and seaweed. Ms. Turner only recently returned to the city after a three-month stay at Pierre Berton’s old cabin in Dawson City, where her husband, Robert, an author, worked on a book about Yukon sternwheelers. She laboured on her own project about the passing of plant knowledge through the millennia, a “huge jigsaw puzzle” of a book. The telephone call from Ottawa revealing her latest honour came with a caveat — she was to keep the news to herself until a formal announcement on Canada Day. Some 2,000-kilometres from her garden, surrounded by wild rose and kinnikinnick, whose berries can be fried in grease and whose leaves make a dandy tea and can be used as a smoking mixture, it was an easy secret to keep.